The Escutcheon Records, Music & Media planet was created by Bassist/guitarist, Arthur J.P. Strand as things evolved from 1966. Escutcheon 8Track, the 8 track recording set-up was followed by Escutcheon Music for publishing purposes. Escutcheon Records evolved in order to sell CDs & vinyl and for the label of the same name. Escutcheon Roadshow ensued to include live music representation by both myself and colleagues. This caused the formation of Escutcheon Media in order to represent all sections and liaise with the public Media. Ecusson Deux became the Control & Command Centre as well as taking care of sports-writing, poetry etc. 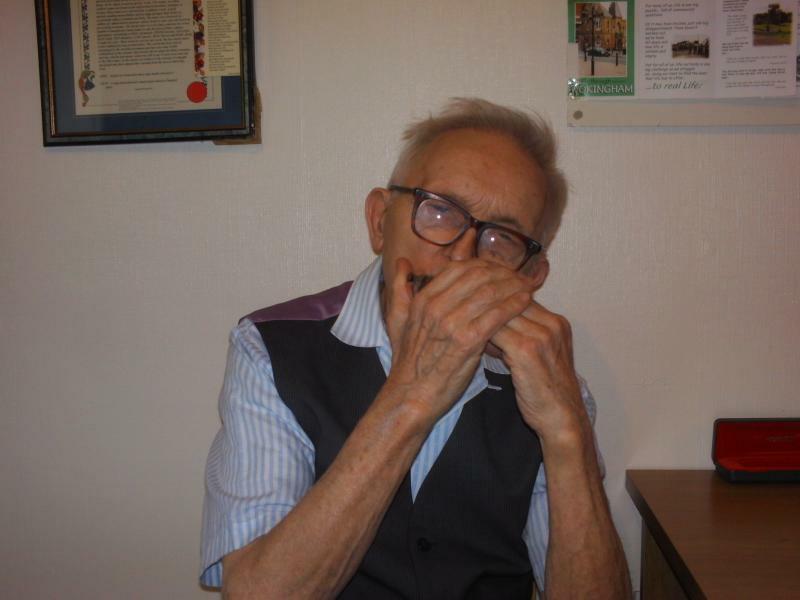 The picture above is of our father, J.R. Strand (Reg) playing a folk tune on the old G chromatic Harmonica. Sadly, Reg passed away in the Royal Berkshire Hospital in the early hours of March 24th, 2014 aged 93 and a half. We have the harmonicas still. All sections in both departments, are run by myself and any other business is attended to by the appropriate organisation which concerns the situation. Direct sales are located on the first Friday of the month except January, and all subsequent Thursdays in Wokingham Market. The stall is now well established. Mail orders are also attended to via Royal Mail.Hohner Harmonicas. Before WW2, Our father, John, more often known as Reg. worked for Boosey & Hawkes in Edgware. 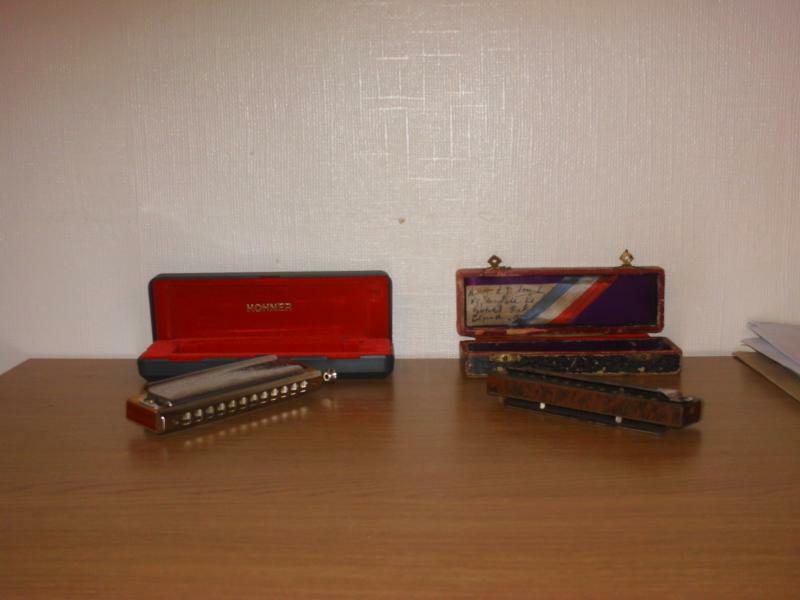 The two harmonicas pictured below are scarcely different and both are Hohner. His original chromatic (in G) harmonica is on the right below. It cost £1 - less staff discount = 16s 8d in 1938. The new one (in C) on the left cost around £80 in 2008. I am a member of the F.S.B. Arthur J.P. Strand began on B flat cornet while at Junior school near Wokingham, Berkshire, England. Taking up Bass, he soon found himself working the semi-pro local scene and went full-time on the circuit working Gigs, residencies, tours deps and sessions. Much of the work was for the military, including almost a year on aggregate in Germany on U.S. Army and U.S.A.F. bases. One of the sessions produced a single by Olivia Newton-John, the first World Wide hit single, If Not For You and yours truly supplied the bass part. Since those days, he has written 214 songs and 150 instrumentals, inluding 14 songs in collaboration with Michael Keith. Currently back playing melodies on cornet after a 50 year break! Working again with very 1st piano man Mike Keith after a similar half-century break! Since the restart, we are working via Skype. My main criticism of Skype ia - why did we not have it 40+ years ago.